As we enter the last week before the new timetables start we come to service 50 which is the one which I catch to work every day. From a personal point of view its swings and roundabouts, or rather swings and no roundabouts as at the moment I stay on the 50 through Derriford Hospital and continue on to Derriford Roundabout, which will no longer be possible next week. I could apparently walk to the roundabout from Derriford but I have paid for a bus pass so I expect to ride all the way! I will either have to change at Derriford for the last few stops or indeed walk. On the plus side its nice to see the proper 15 min frequency extended as there are a few gaps in the morning peak to Derriford at the moment. Does the 50 you get in the mornings change to a 61 or 62 or a different service? I'm pretty sure one early (ish) 50 to Derriford changes to a morning peak 28B from Derriford. If it does change to a different service it may well continue to do this in the morning peak. The loss of changing to a 61 and 62 and vice versa is a very welcome move, albeit a bit inconvenient for some passengers. 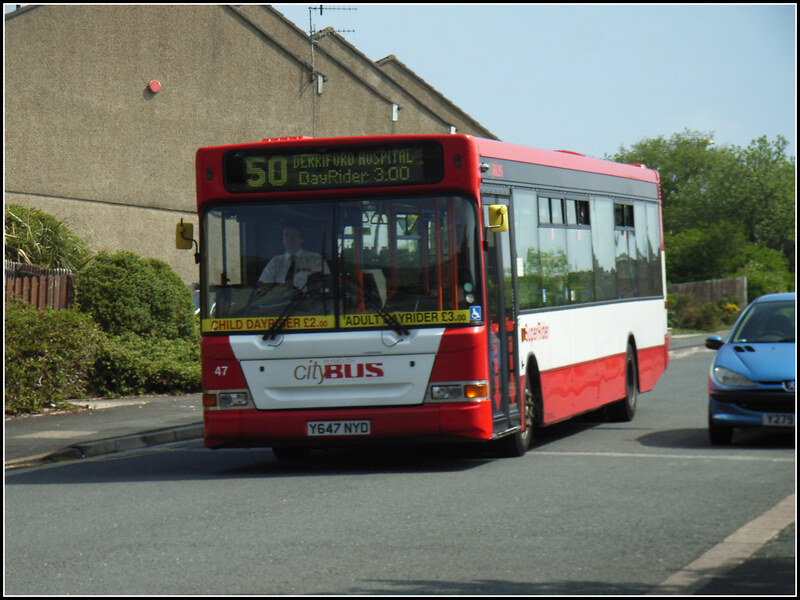 Several passengers at ASDA know which 50s change to a 61/62 and use this to get to Asda and back home to Crownhill Road etc. It's this east to west link that I think would make a really profitable service, start at the Victoria Road roundabout, then Crownhill Road, Transit Way, Derriford Hospital to ASDA and back. I myself have used the 50 as a through link to Transit Way a few times, though this has always come at the expense of very poor reliability. As this is set to make for a much more reliable Service 50 then it's a small price to pay. The 1712 Schoolday only run from Derriford will clearly come off a school run, whether or not it will continue to come from the 102 from DHS Boys - DHS Girls - Crownhill - Southway - George Junction remains to be seen. Always thought it's a bit odd having the driver hanging around at the George Junction for about half an hour is odd, but there we go! Also, does anyone know anything about these? These were posted on October 18th. Variation Accepted by SN: Operating between TAMERTON FOLIOT, C'ham Road and ROYAL PARADE/MILEHOSE Central Park given service number 42/42A/42B/42D effective from 11-Nov-2012. To amend Route. service number 109 effective from 11-Nov-2012. 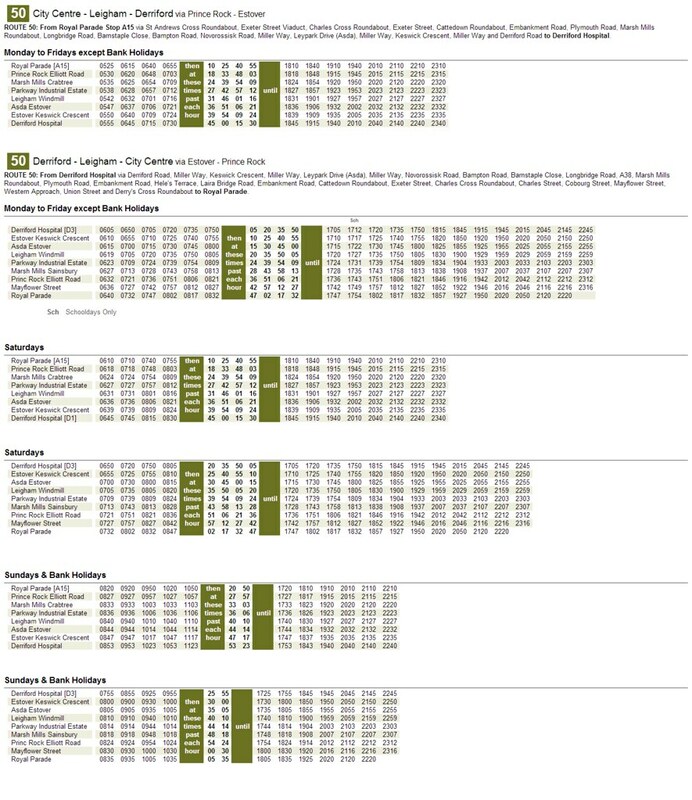 To amend Route and Timetable. It also appears that the 25 has reverted to its former route via Derrys Cross to Royal Parade, as the original idea of operating via Millbay Road, Western Approach to North Cross and Mayflower St attracted several complaints from residents.